The 2018 Renault Duster Next Generation is expected to launch in this festive season. The upcoming version will get more features and many cosmetic upgrades. However, it might still continue with the same engines. Here, we answer all your questions and doubts regarding the SUV. The Renault Duster was launched back in 2010 and since then has been one of the most popular cars in India. Globally, around 2.45 Million Duster models have been sold since its launch. Now, it is ready to get its next-generation launched in India. The 2018 Renault Duster is expected to launch in this festive season. It will get a new design scheme, some cosmetic changes on the exteriors and interiors as well and some feature upgrades too. The features on this one were not that less, but there would be some more premium too. The upcoming SUV is expected to cost starting from Rs 8.5 Lakhs to Rs 13 Lakhs (ex-showroom). Its competitors can include some lower variants of Hyundai Creta, Nissan Terrano, and Maruti Suzuki S-Cross. 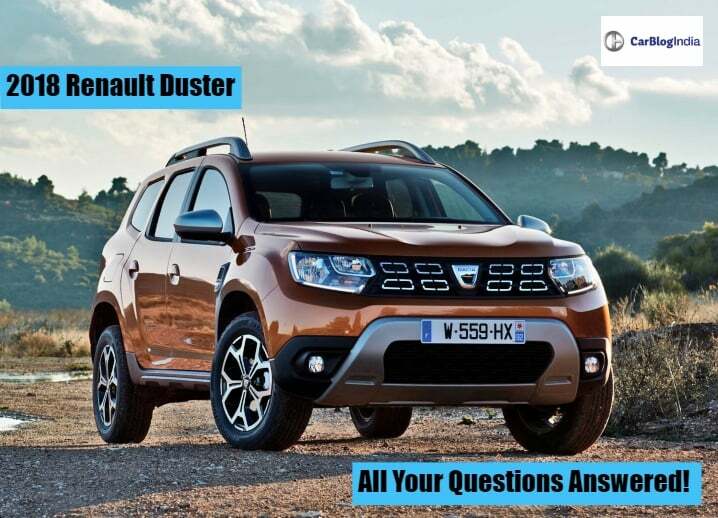 Through this article, we answer all your queries regarding the upcoming Duster. When will the 2018 Renault Duster launch in India? The next-generation model has been launched recently in the Middle Eastern countries. In India, we expect it to launch in Festive season 2018. What is the expected price of this upcoming SUV? Currently, Duster starts from Rs 7.95 Lakhs (ex-showroom) and goes up to Rs 12.79 Lakhs (ex-showroom). After the latest generation launch, it might demand a little premium over the current model. Expect the 2018 Renault Duster to be priced from Rs 8.5 Lakhs to Rs 13 Lakhs (ex-showroom). What are the engine specifications? The Renault Duster might continue with its ageing old 1.5 Litre petrol and diesel engines. The petrol unit produces around 106 BHP of power and 130 Nm of torque. The diesel unit also comes with two options – 85 BHP unit and 110 BHP unit. The larger diesel unit comes in the top-sned variants. What transmission does the SUV get? As we said, there will be no mechanical changes to the 2018 Renault Duster. It will continue with the same 6-speed manual gearbox with an optional 6-speed Automatic transmission. What are the features of the upcoming SUV? What safety features will the SUV have? For safety measures, the 2018 Renault Duster will get 2-airbags, ABS with EBD, reverse parking sensors with a camera. The global version of the SUV gets Hill Descent Control, Multiview camera, and Blind Spot Warning. However, we do not have any confirmation on the news till now. Who will the SUV compete with? Lastly, the 2018 Renault Duster will continue its rivalry with Hyundai Creta, Nissan Terrano, and Maruti Suzuki S-Cross. While there is the Renault Captur too, but it goes a little higher than its competitors. In this, Creta and Duster are the frontrunners. Stay Tuned to CarBlogIndia for more updates on the upcoming 2018 Renault Duster.